Radio signals are not, as is commonly thought, recent phenomena. Nature has spoken through radio signals since the origins of the Universe. 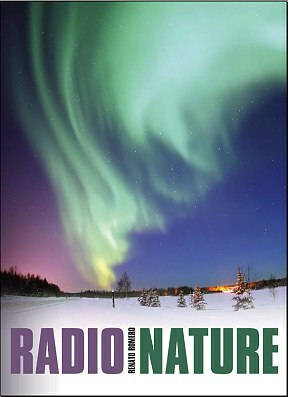 Radio Nature is fascinating look at these signals, a guide to receiving and analysing them. Radio Nature describes these strange signals coming from our own planet and beyond. There is information about tweeks, insects, whistlers, choruses and even flying saucers (nothing to do with spaceships). Readers are provided with details of artificial and false signals that can confuse the natural radio listener. For the more committed there are designs for simple receiving equipment and antennas along with guides to how you can use simple receiving equipment to hear natural radio. The book also explains how to try to predict storms and even earthquakes using the signals that can be captured. Radio Nature is truly a book for all. If you are a beginner the book opens up a fascinating area for you. For the more committed this provides a comprehensive guide to natural radio and useful reference work. E’ opinione comune che la nascita dei segnali radio corrisponda con le scoperte scientifiche di Marconi. La Natura in realtà esprime la sua voce attraverso segnali radio fin dalle origini del nostro pianeta. Questo libro è un affascinate viaggio in questo mondo, alla scoperta di suggestivi segnali simili a fischi, cori e voci, ed ai vari sistemi con cui è possibile riceverli. 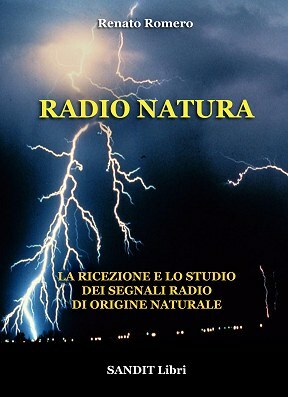 Benvenuti nel regno di Radio Natura! so we consider it part of the environment we see every morning on waking up. philosophers and sociologists consider that. not with observations in an optical field. fascinating. They deserve a precise definition: “Radio Nature”. is possible only in hyper-technological environments; thankfully this is not true! explanation of how they originate and how to build a receiving station. propagate, I will mention other kinds of emissions which are not really “natural”. to recognize them when they are received. enables us to access these publications at any time and from home. have much information about the subject! having the strong wish to believe in something in what we want to believe.